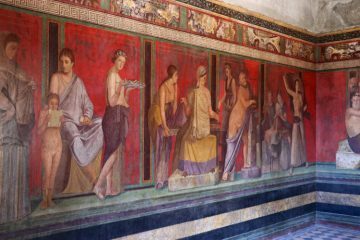 The Campania Arte Card is a fantastic savings deal on public transportation and sightseeing in the Naples region including skip-the-line admission to Pompeii, Herculaneum, Paestum and major museums. 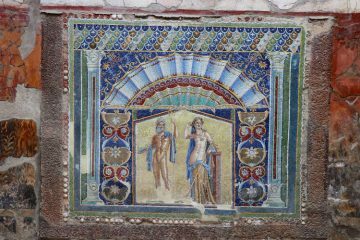 Travelers to Naples and cultural sites in the rest of the Campania region including Pompeii and Herculaneum save with the Campania Arte Card on sightseeing admission tickets and public transportation. The 3-day Tutta La Regione card gives free admission to two sites, half price admission on a further 80, and unlimited public transportation on buses, funiculars, the metro and regional trains. It is good value, permits using the fast skip-the-line ticket windows to jump queues, and cut out the need to buy separate train and bus tickets. The Campania Artecard comes in several versions but for most travelers the most useful versions are the 3 giorni Tutta la Regione (3-day whole region) cards that are accepted at all major cultural sights and on local public transportation in the Campania region around Naples. Public transportation on local buses, the Naples metro and regional trains are free. This is a major benefit as it cuts out the need for queuing up to buy regional train tickets, which are often available at ticket windows only. As children under 18 have free admission to most sights, no children’s version is available, which is a pity, as families will need to buy train tickets separately. The card pays for itself very quickly: for example a visit to Pompeii (€15) and the National Archaeological Museum in Naples (€12) and using the metro and trains on a return trip from Naples will cover the cost even before seeing further sites such as the Herculaneum (€11) or the Catacombs (€9). The Campania Arte Card is available from most major museums and participating archaeological sites. 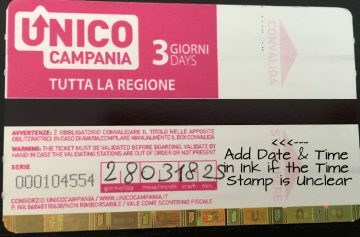 If bought online in advance, any voucher must still be exchanged for a physical machine-readable ticket – usually at Naples airport or Naples Garibaldi central station. It is not sold at all tourist information offices but all could tell you where to buy it. 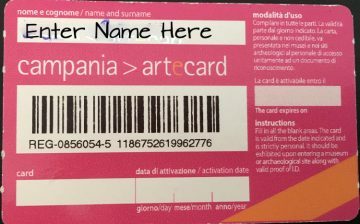 The Campania Arte Card is not valid on the Alibus between the airport and Naples Garibaldi station and port – buy the €5 ticket directly from the bus driver. Before first use, the bearer should enter full name in ink on the card. On first use on public transportation, a validation time should be stamped on the back of the ticket. Manually validate in ink the time of first use in case the transportation machine stamps the time illegible. The card is valid from the first use at a museum or on public transportation and automatically expires at midnight on day three. At public transportation ticket gates, insert the card slightly counter intuitively with the arrows side down or to the back. At museums and archaeological sites, a paper ticket must still be picked up from the ticket windows. 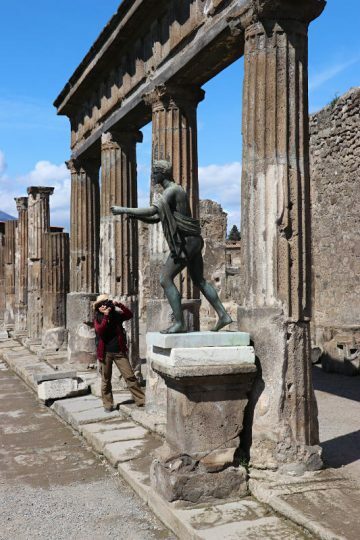 At sites such as Pompeii, use the fast-lane vouchers ticket window while Campania Arte Card holders may legitimately, if somewhat embarrassingly, go to the front of the queues at other sites. As the first sights visited when using the Campania Arte Card are free, it makes sense to first see the more expensive sights such as Pompeii, Herculaneum and the National Museum of Archaeology in Naples. Note: for the young person’s card a few of these sights, including the popular catacombs and theater, may only be selected for a discounted and not free admission. The 7-day Tutti-La-Regione card gives free admission to the first 5 sights and then up to 50% discount for seven days. It is fantastic value at €34 but does not include any transportation benefits. The 3-day Napoli card that gives free admission to three sites and public transportation inside the city of Naples and then half-price admission on a further 40 sights. It cost €21 (€12 for young people). This card does not include Pompeii, Herculaneum or any sites outside Naples city limits. These cards are also available online from Tiqets or from most of the major sites where the card is valid. 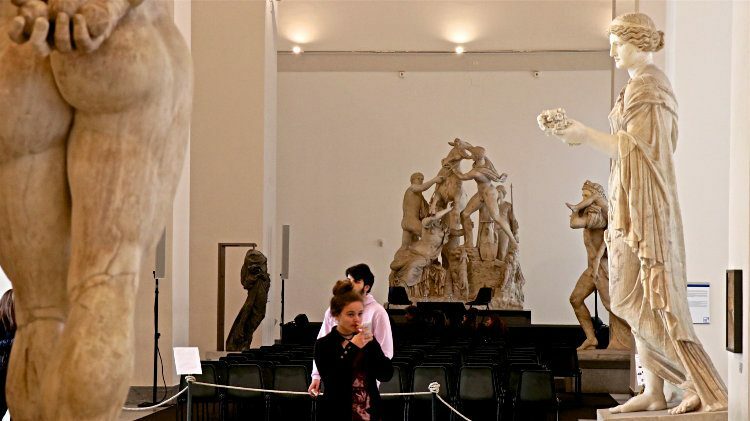 Visit the National Museum of Archaeology in Naples – home to the Farnese sculptures and the best artworks, mosaics and frescoes from the excavations of Pompeii and Herculaneum. Book Campania Tours at GetYourGuide.